How realistic are these pivots to video? The phrase “pivot to video” has become a common “strategic” explanation for newsroom layoffs over the last couple of years. It’s, on the surface, convincing, because the rise of video content, especially social video, real. It’s a booming area. But all too often the excuse doesn’t match the reality. 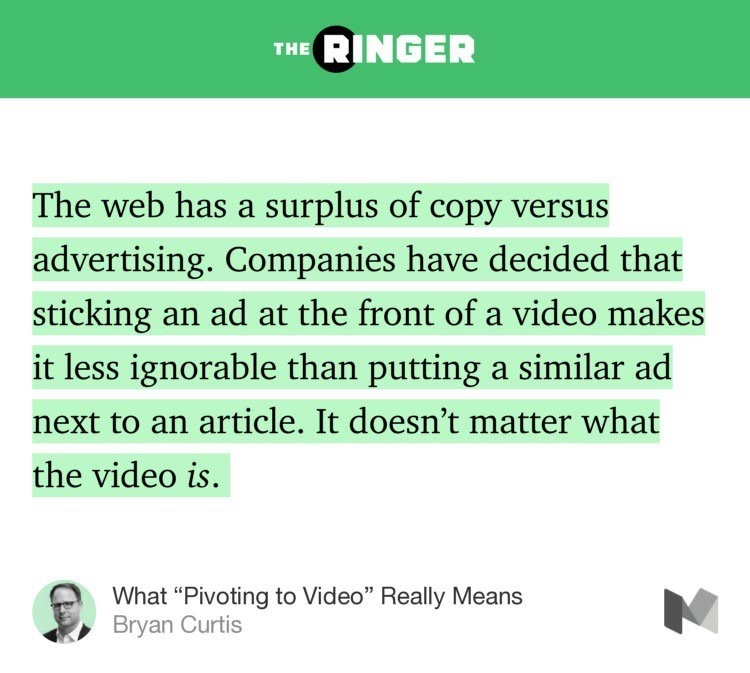 Why this is happening is simple: The web has a surplus of copy versus advertising. Companies have decided that sticking an ad at the front of a video makes it less ignorable than putting a similar ad next to an article. It doesn’t matter what the video is. Of course, that’s (at best) a short term strategy — at some point, the supply of video will rise to meet the advertising demand, and then attention on those videos will start to matter again. And that means quality will out. But we’re in for some rough years in the meantime. Are we losing our words? A “pivot” begs the question of not just what we in the digital media are pivoting to but away from. In the case of the recent layoff victims, the answer was good reporting, fun commentary — and a rapidly receding past where mere words were enough. That past is the past, though. Print could only support words and pictures. Digital has so much more than that. The web, apps and the other forms of the 21st century open up different forms of storytelling — but merely pivoting to video isn’t enough to embrace that future. It’s much more about embracing the whole toolbox of digital content — and that’s a significantly more complex thing to do. I’m terrible at plugging my own stuff — and always feel awkward doing so — but this once, my Digital Content Strategies and Social Video courses feel like they might be useful to people interested in this post. Check them out!